With YOUR donation you support our work! 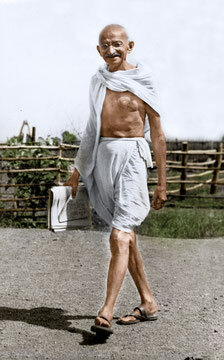 Mahatma Gandhi walking at Satyagraha Ashram, Sevagram, 1945. The GandhiServe Foundation needs financial help to execute its numerous scientific and educational projects. We aim to promote the life and work of Mahatma Gandhi, believing firmly that Gandhi‘s message of truth, love and nonviolence is still relevant today. Or even more relevant than ever before, considering the ecological catastrophy we‘re facing, and the increase of different forms of violence in both personal and public life. The ethics of nonviolence, as practised and cultivated by Mahatma Gandhi, live on, regardless of national or political boundries. 2) the execution of such educational projects which propagate peace, the ethic of nonviolence, and the memory of Mahatma Gandhi and his teaching. The GandhiServe Foundation is a charitable body as per §5 - 1, No.9, KStG - Germany. Donations are tax exempted as per §10, EStG - Germany. A receipt - in German or English - will be sent immediatly.